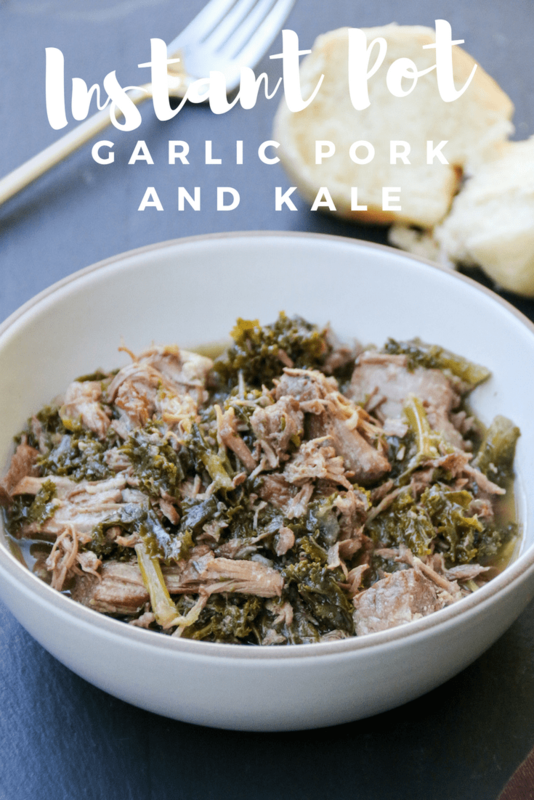 I love a good instant pot pork recipe, this recipe for garlic pork with kale is my family’s absolute favorite. This recipe will blow your dang mind. For real. Even if you aren’t that into pork (like me), or kale (also like me), there’s something about the way the pressure cooker disintegrates the garlic into the sauce that makes it all add up to some serious magic for your mouth. Bonus, my 8-year-old daughter LOVES this dinner (did I mention it has kale? yeah, she still gobbles it up) and it easily freezes for leftovers, which can be repurposed deliciously in a way I will explain later in this post. So, let’s talk about the Instant Pot. I’m obsessed, as I am sure many of you or your friends are. I got mine about a year ago, and didn’t start sharing recipes because I didn’t feel they would be useful, because most people didn’t have one. Well, it seems Instant Pot has now reached some sort of critical mass, and people want recipes! So, I have been experimenting over the last year with making some of my favorite recipes faster and easier in the Instant Pot, and now I think it is time to share. You can benefit from my year of early-adopter learnings, or if you don’t have an Instant Pot (or whatever pressure cooker), you can make this in a crock pot. 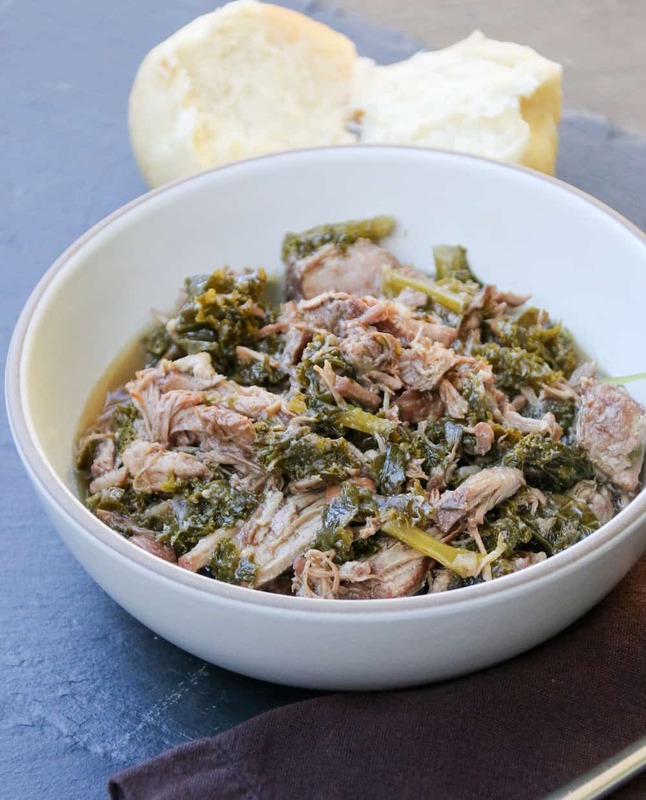 I have been playing around with this Garlicky Pork Shoulder & Greens Recipe from Williams Sonoma for about 6 months. It’s an amazing recipe, and I think I have converted it to the Instant Pot in the best way (this is based on probably about 24 different tries). It makes about 6 servings (but really it can be more or less depending on how much pork shoulder you use and how much your family members eat in one sitting). Enjoy! 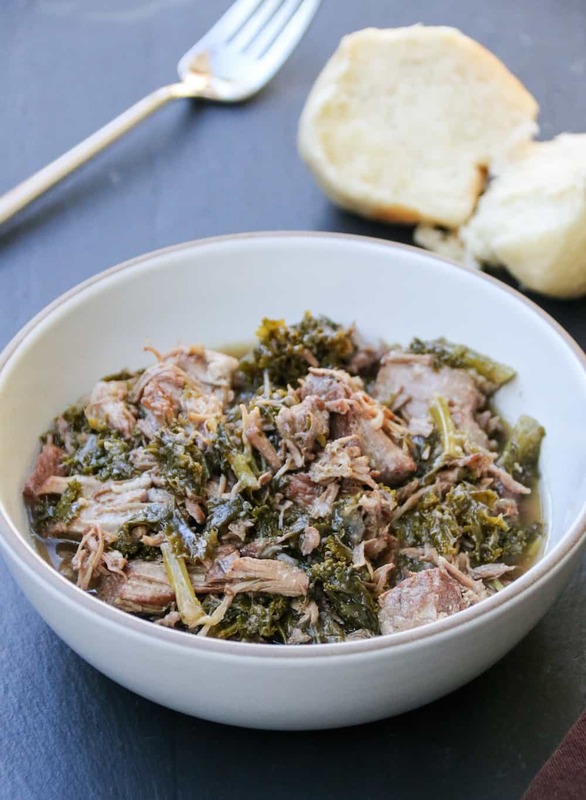 A delicious, tender pot of shredded pork with kale and garlic. 2/3 cup beef or chicken broth (I have tried it both ways and it makes little difference so use what you have – my favorite was with pork broth that I made from the leftover pork bones from making this recipe previously). Season your chopped up pork generously with salt and pepper. I’m talking lots of salt and lots of pepper. Set your [amazon_link id="B00FLYWNYQ" target="_blank" ]Instant Pot[/amazon_link] to sauté and warm the olive oil. Working in batches, add the pork and sear, turning as needed, until well browned on all sides, 6 to 7 minutes. Using a slotted spoon, pull it out of the Instant Pot and transfer to a plate. Pull the pot out and pour off most of the fat. This is key, your dinner will be greasy if you don’t do this (pork shoulder is fatty). Return the pot and turn on the sauté function again (If you prefer, you can do all of these steps in a pan on the stove, but I try to be Instant Pot-only for clean-up’s sake). Add the onion and thyme and sauté until the onion is golden brown, about 5 minutes. Add the garlic (all 20-25 cloves, fully not chopped) and rosemary and cook for 1 minute. Pour in the wine and vinegar and stir to deglaze/scrape up the browned bits from the pan bottom. Add the broth and the pork and stir to combine. Cover. Use the manual setting and set it for 40 minutes at high pressure. When the time is up, use quick release. Take the lid off and add the kale. Put the lid back on, turn it to seal, and cook at high pressure for another 10 minutes. Do a quick release again (not required, but you’re probably hungry by now). The pork and kale should be very tender. If you stir, the pork will shred (kinda like carnitas) or you can be delicate and keep it in fork-tender bites. Using the slotted spoon, transfer the pork and kale to a platter. Skim any fat off the cooking liquid (this is key… this can be a fatty meal (which is delicious, but best to skim where you can), then drizzle the liquid over the meat and serve immediately. I like to serve this with a salad (which my kid doesn’t eat) and crusty bread (which she does eat). After dinner, let it all cool to room temp, then throw the leftovers in a freezer bag, write the date on it, and throw it in the freezer. Whenever I am stressed about what to cook for dinner, I whip a bag of these leftovers out of the freezer, defrost it in the fridge (if I think of it in time to do so) or in the microwave, then throw it into the Instant Pot on the “keep warm” setting. This warms it all up in about 30 minutes (or less). The leftovers at this point are a fully shredded pork, so I serve it with sandwich rolls (really any kind of bread will do – go full toasted hot dig bun if that’s what you have, provolone or swiss cheese slices, and some mayo and (for my husband) jalapeños and we eat them like cheesesteak sandwiches. I have to be honest and say that this is my more favorite way of eating this meal… I like leftover night even more than the first night. Please try this and let me know what you think. Many members of the Curtis clan have asserted that they hate kale, until they eat this and are like “I guess kale can be delicious.” So there. Ha! Wow this looks so delicious and hearty. I can’t wait to try it. Pork is a family favorite in our home!